...the closer one gets to the natural world, the less one fears death. ... However, if one loses one's fear of death one naturally becomes a rebel. Clayoquot is the story of Krawczyk's radicalization. The book intercuts two different timelines: a "present" story about her life in a cabin at Clayoquot Sound and how that led to her becoming an activist for old-growth forests, and a biographical narrative. The latter starts with her Catholic Cajun girlhood in a close-knit Louisiana community; she got cold-shouldered out of there when she refused to oppose racial integration. After that she did things like get married a few times, have kids, work. She met feminists and other progressive people and thought about their ideas. You can see that she was not just a natural "aginner" but gradually found her way to a different way of thinking, relating, and acting on the basis of experience. When I first started reading, I was a little put off by all the misspellings, but after a while I decided it wasn't the mark of a poor author, but a literally poor publisher who wouldn't spring for proofreading. The book is physically very nicely published, though; it's a trade paperback with good paper, decent-sized type, and an attractive stiff cover that has built-in flaps you can use to mark your place. The shape of the book's writing is skillful: her characterizations are pithy and empathetic; dramatic events are recounted, but not milked for length; the intercutting of different time periods adds a lot of suspense, and simultaneously covers for the abandon with which she jumps from one pivotal event in her life to another. As we read, we find out that she taught herself to be a professional writer, and that her early work was for "true confessions" magazines (a genre I must confess I consumed avidly in my early teens). I haven't finished the book yet, I'm reading it slowly and savouring it. One of the early scenes is of a mass campout against old-growth forest logging, and it reminds me of a similar scene in Jeannette Armstrong's Whispering in Shadows (see my review in the 2006 section of this blog). Armstrong is a First Nations woman, and Krawczyk writes about not talking with the indigenous people then, because she didn't know what to ask. Obviously, she recovered from this reticence later. 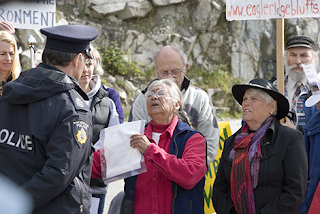 At Eagle Ridge Bluffs, she was arrested along with respected Aboriginal Elder Harriet Nahanee. Harriet died February 24 2007 at age 71, of an illness that went untreated for the two weeks she was forced to serve in jail for blocking the road development. The picture to the right is from an article about the two of them and their cause that appeared in the online newspaper The Tyee in March of 2007.